The Britannia Building Society is to merge with Co-operative Financial Services (CFS). Some branches may close if they are too close to each other but the two mutuals have promised there will be no compulsory redundancies. The new business will be a subsidiary of The Co-operative Group and Britannia members will become Co-op members. The merger will only be possible if a new law allowing mergers between mutuals is passed in March. The Building Societies (Funding) and Mutual Societies (Transfers) Act, known as the Butterfill Bill after its sponsor Sir John Butterfill MP, would give building societies greater freedom to merge with other companies. It will also change the current restrictions on the way they are allowed to raise money. The deal will have to be approved by Britannia members and the integration of the two businesses will take three years to complete. 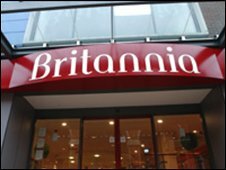 "Customers will be owners and will have available all the services they would expect from a major financial provider, together with a real say in setting strategy combined with a share of the profits," said the Britannia chairman Rodney Baker-Bates. The merged business will have nine million customers, more than 12,000 employees, 300 branches and 20 corporate banking centres. In towns in which the merged group ends up with two or more branches, some of them may close, but there has been a promise that there will be no compulsory redundancies among branch staff. The two mutuals said they would continue to have a significant presence both in Manchester, where CFS is based, and in Leek in Staffordshire where Britannia is based, but warned there might be some redundancies among head-office employees. They said the customer-owned "super-mutual" would be an ethical alternative to shareholder-owned banks. "Owing to the damage done by the credit crunch, people have been crying out for a new way of doing business with a financial organisation of substance that truly has their interests at heart," said CFS chief executive David Anderson. "This merger will create that organisation and we'd hope to attract many thousands of new customers as a result." Customers would not see any immediate change to the services they receive, the two mutuals said. The enlarged business will continue to trade under both the Co-op and Britannia brand names. As a result anyone with savings accounts at both organisations will retain their separate £50,000 deposit protection offered for each business by the Financial Services Compensation Scheme (FSCS). Both lenders claim to be financially strong, with a combined profit of £267m in 2007. However the Britannia revealed its earnings for 2008 would be dented by losses on money lent to two banks which have collapsed in the past year, and the high cost of contributing to the replenishment of the FSCS, which has been used by the government to bail out banks such as Icesave and the Bradford & Bingley.